With all due respect to every department store around the world and every Sephora outlet there is, the fact is that Beauty.com has amazing gifts with purchases. Where are you going to get a gorgeous designer collaboration bag with some 15 deluxe samples? Sephora Dubai has a very generous card programme, as you can see here and here, but you need to watch out for the offers to turn up, and only Black Card (equivalent to Sephora USA's VIB) or Gold Card (VIB Rouge) owners are eligible for the best gifts. On the other hand, anyone buying from Beauty.com can avail of the generous GWPs they have. These are not random vinyl pouches with a dozen sachets. I am talking about designer bags exclusively made for Beauty.com, by Richard Chai, Cynthia Rowley, Lela Rose, EDUN, Tess Giberson and others. 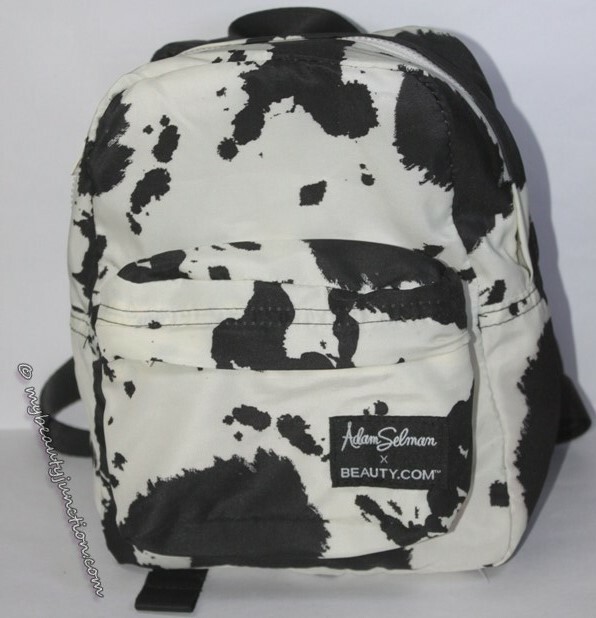 Today's post features the Miss Baby backpack, which has a print from Adam Selman's Fall 2014 collection. Adam Selman, for the uninitiated, is Rihanna's costume designer. 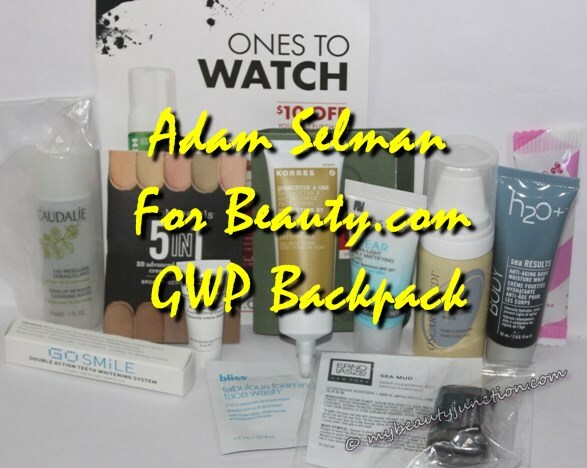 Check out the Adam Selman Miss Baby Backpack and the deluxe beauty treats inside, further below. Check out the pattern on the backpack, which itself is a decent size. This is a great travel makeup bag, or a gift for the toddler starting kindergarten. The total value of this bag is $130 and I got it free on purchase of products worth $100. The haul post is for another day! 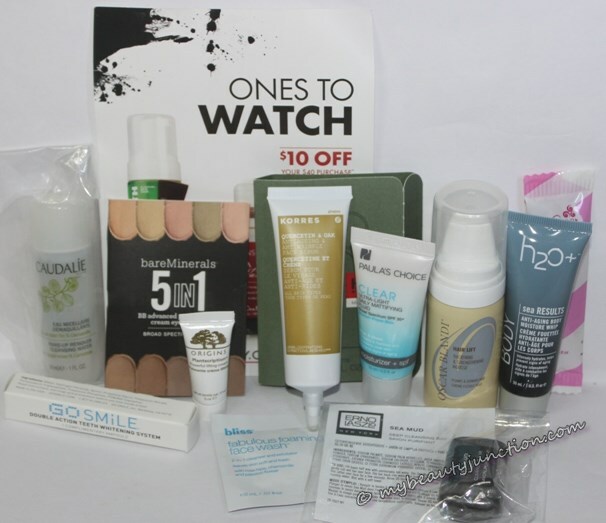 Some big-name brands in this bag - I am already loving the BareMinerals 5-in-1 BB cream eyeshadow, the Oscar Blandi Thickening Mousse and the Caudalie Micellar Water, which I have used before. And, I used up the 10% off coupon on another haul, thereby getting myself another gorgeous GWP which I will show off next week. The good news is, if you run quickly enough, you can get yourself an EDUN Wool Felted Pouch with some great samples here from Beauty.com, free with purchases of above $150. The pouch is made in Kenya, with the same felt that featured in EDUN's diamond runway. Samples in the bag include Jurlique, Peter Thomas Roth, Jane Iredale, Origins, a full-sized Nails Inc. polish and more! You cannot tell how long these offers are valid for, and they run out of stock soon, so do run! If you want to buy from Beauty.com but don't really know what to add to your cart, I highly recommend the Miracle Skin Transformer, the Tanda Zap (for acne-prone skin), and all products from NUXE. All this and more were part of my recent haul - stay tuned for the haul post! Have a great weekend, everyone!